uuid : 483468a0-4cb9-45b5-b71f-e218c74de271 templates_id: 119490 templates_uuid: "7fc79249-46b6-44cd-9a94-e74f759d8b2b" title: "T&C for Supply of Services to Business Customers " display_name: "Terms and conditions for supply of services to business customers " meta_keywords: "T&C\'s for supply of services B2B " description: "
Put your business on a firm footing with these clear and fair terms and conditions for supplying services to business customers. 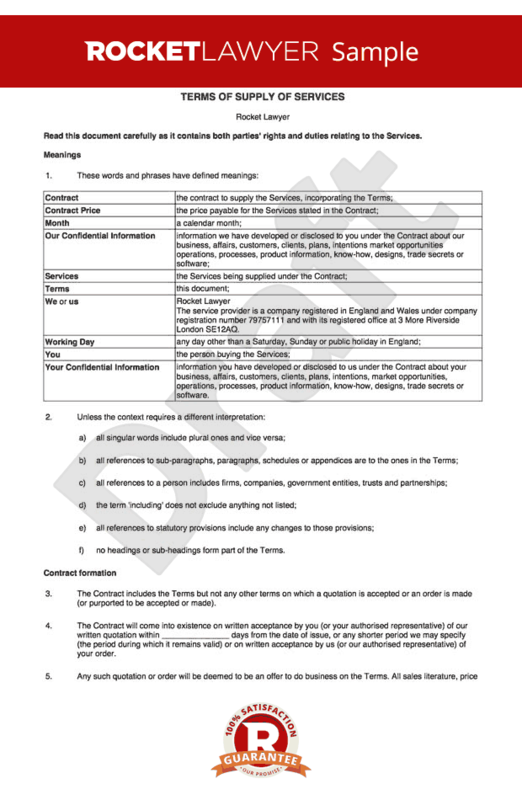 Use this straightforward terms and conditions template for any business in England & Wales that sells its services to other businesses to ensure that customers know where they stand and needless disputes can be avoided. These terms of service cover key issues such as orders, specifications, obligations, pricing, payment, intellectual property, confidentiality, warranties, liability and termination. What are terms and conditions for the supply of services to business customers? Terms and conditions for the supply of services to business customers (also known as T&Cs) should be used if you want to supply services to another business customer on standard terms. They should cover key issues such as orders, specifications, obligations, pricing, payment, intellectual property, confidentiality, warranties, liability and termination. Why do I need terms and conditions for the supply of services to business customers? Terms and conditions for the supply of services to business customers protect your business interests, ensure that customers know where they stand and help avoid disputes. T&Cs should appear on the back of all contractual documents, including quotations, order forms, acknowledgements of orders, delivery notes or in a brochure or catalogue. They should be available to a customer before or at the time an order is placed. This helps to ensure they are binding. How do I clarify the position on ancillary goods? You should consider whether the services involve the provision of any related goods or materials. Whilst many service agreements involve pure services, many involve the provision of ancillary goods (eg provision of advertising material, design services or brochures). If ancillary goods are being provided, you will need to include a provision for this in the terms and conditions and a description of the deliverables in the specification. What if services are being performed on customer premises? If your services are being provided on your client\302\222s premises, it is important to follow any reasonable instructions about using the premises. The customer should also allow you access to the premises, maintain the premises and tell you about any relevant regulations. Provision for this should be made in the T&Cs. Should I include a price list in the terms and conditions? The terms can allow for prices which have been individually agreed with the buyer. If a price is not individually negotiated and set out in the order, any price list should be brought to your customer\302\222s attention before the contract is entered into. It can be published on a website or be available on request. What happens in the event of order cancellation? Once an order has been made and accepted, it is binding and it is up to you to agree to any subsequent cancellation by the customer. If you want certain conditions to be met on cancellation \302\226 such as payment of a percentage of the price of the services \302\226 this should be specified in the T&Cs. How can I ensure that invoices are paid on time? You should specify, in the T&Cs, the length of time a client has to pay an invoice upon receipt. You can include a rate of interest on late payments in the T&Cs. It should not be too high, otherwise it may be deemed invalid. If there is nothing in the agreement that specifies how much interest is to be paid, then the statutory interest rate applies which is 8% above the Bank of England base rate of 0.5%. Can I specify terms of warranty? Can I exclude or limit liability? The difference between business to business contracts and contracts with consumers is that some rights can be excluded in contracts between businesses. Any exclusion, even in a business to business contract, must be reasonable to be valid. However there is an absolute ban on excluding or restricting liability for death or personal injury resulting from negligence. If you\302\222re ever unsure about what terms and conditions can be excluded in your business to business agreement, Ask a lawyer. Can I set a financial limit on any liability under the contract? You can cap your financial liability under the contract to a reasonable amount. This should be stated clearly in your T&Cs. When deciding on a limit you should consider the level of service being supplied, the risk of causing loss and damage and what is common in the relevant marketplace. This limit must be reasonable to be enforceable.
" created_timestamp: "2018-10-08 04:36:22.0" modified_timestamp: "2018-10-08 04:36:22.0" active: true created_by: 236 modified_by: 236 dcm_id: 293 url_slug: "Terms-and-conditions-for-supply-of-services-to-business-customers" meta_description: "Prepare terms and conditions for supplying services to business customers with help from Rocket Lawyer. Put your business on a firm footing with these clear and fair terms of service. Try these terms and conditions of service for business customers." time_to_complete: "10 minutes"
If your services are being provided on your clients premises, it is important to follow any reasonable instructions about using the premises. The customer should also allow you access to the premises, maintain the premises and tell you about any relevant regulations. Provision for this should be made in the T&Cs. The terms can allow for prices which have been individually agreed with the buyer. If a price is not individually negotiated and set out in the order, any price list should be brought to your customers attention before the contract is entered into. It can be published on a website or be available on request. Once an order has been made and accepted, it is binding and it is up to you to agree to any subsequent cancellation by the customer. If you want certain conditions to be met on cancellation  such as payment of a percentage of the price of the services  this should be specified in the T&Cs. The difference between business to business contracts and contracts with consumers is that some rights can be excluded in contracts between businesses. Any exclusion, even in a business to business contract, must be reasonable to be valid. However there is an absolute ban on excluding or restricting liability for death or personal injury resulting from negligence. If youre ever unsure about what terms and conditions can be excluded in your business to business agreement, Ask a lawyer. More than just a Terms and conditions for supply of services to business customers template, our step-by-step interview and guidance makes it easy to create your document. Easily create online, download, print and sign your free Terms and conditions for supply of services to business customers in minutes. This document is also sometimes called: T&C's for supply of services B2B .